I like to make my sons' birthday cakes myself. While I'm far from an expert decorator, I can pipe a passably straight line of buttercream. I try to keep the designs simple while still giving my boys a cake that they'll enjoy. For my younger son's first birthday, I got my inspiration from his favorite book, Thank You Prayer . I read this little book to him before bed every night. 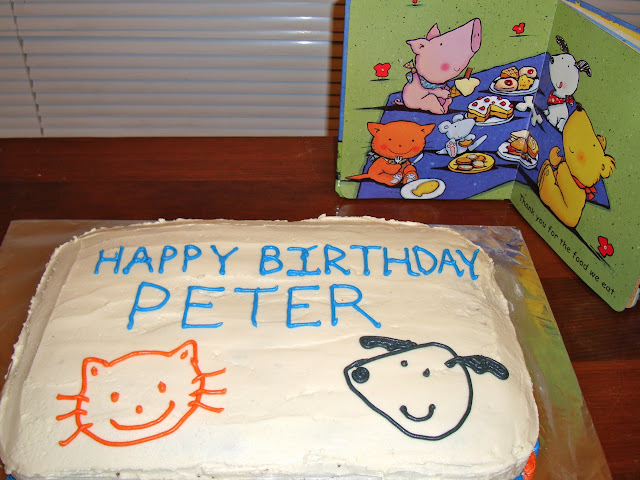 The pictures were simple and worked well on a sheet cake. I copied the design onto the plain, frosted cake using a toothpick first. That way, if I messed up, I could just "erase" it with a spatula. Then I piped the frosting over the top of the lines I'd drawn. Voila! A cute cake with one of my boy's favorite things on it. For his next birthday - coming up in just a few months - I may try making a Hot Rod Hamster cake.